I love my new monitor. The colors are great, it's sharp, the angles are good. Only one problem: it's really really bright. It has contrast, too -- but the monitor won't change contrast when running through the DVI cable (this is even documented in the monitor's manual). I have no idea why. It makes me wonder whether there's normally a way of changing brightness over a DVI cable; but lots of googling hasn't brought enlightenment on that score. but this was all looking like quite a hassle. I wanted an easier way to change brightness. xgamma wasn't it: it works well for fine-tuning but its brightness curve is way off if you try to depart by much from full brightness. xbrightness is an excellent little command-line program that sets the X gamma curve to appropriate values. Just run xbrightness BRIGHTNESS passing it a value between 0 and 65535. xbrightness-gui is an interactive program that lets you drag curves around for each of the three color curves, or the combined image, with a user interface very similar to GIMP's Curves tool. You can even save and load curves. xbrightness-gui's coolness notwithstanding, the simple xbrightness was really all I needed. It does a fine job of adjusting the monitor brightness while keeping colors neutral. The version I was using was Mikael's version, to which he'd added the ability to adjust colors too (much like xgamma does, but using more useful curves). It turns out I don't need the color correction, but it's nice to know it's there. But what I did need was a way to query the current brightness, and, more important, a way to bump the brightness a little bit up and down. So I added those features. Getting the current brightness isn't actually something you can do, since the whole gamma curve for the three channels is what you perceive as brightness. I didn't try to estimate perceived brightness based on the whole curve; I just took the value of the highest value for each color, and their average or maximum. Then I tied my new increment/decrement into key bindings in Openbox. I bound W-F5 (the Windows key plus F5) to xbrightness -2560, and W-F6 to xbrightness +2560, so I can go up or down in brightness by pressing keys without having to type any five-digit numbers. I've made available the old xbrightness-gui, since it's no longer available anywhere else; a patch that integrates my changes and Mika's into xbrightness-0.3; and the patched xbrightness tarball. They're all at http://shallowsky.com/software/xbrightness/. One other fun thing about using X gamma settings to adjust brightness. The first night I used it, I noticed at some point that my cursor looked very different -- it had become blindingly white. 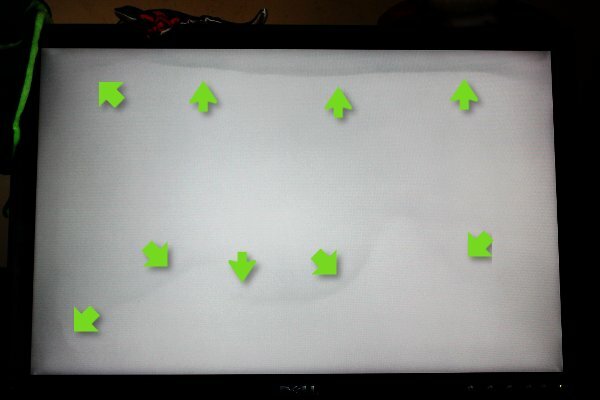 It turns out that the cursor is implemented at a lower level and doesn't go through the X gamma system. 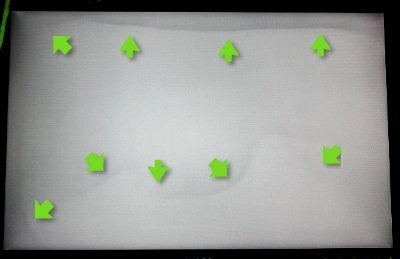 So turning the brightness down via gamma curves doesn't affect the cursor, which remains always at full brightness. It's quite a nice side effect -- the cursor is much more visible than it normally is.